This stylish bomber jacket is made of soft brushed leather for a light sporty look with a little edge. Streamlined silhouette with covered zip front and point collar. 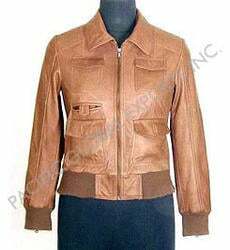 Unbelievable price on Short Bomber Jacket in New Delhi (India) company Pacific Global Exports Inc..